Well, as you can see, the Mustang put this one right to sleep. He was not too interested in how fast, how loud, or how it shifted, he was out like a light. Teri and I have Colsyn and his little brother. they spent the night. It was Ice Cream Thursday so we stopped at the local drug store for chocolate ice cream cones yesterday. Last night we burned on the tree that we have lying in the back yard. got over half of the trunk gone now. After lunch today, Rylan wanted to ride in grandpa's race car so off we went. About 4 miles into our 8 mile ride he was gone. Not enough bucking by this pony to keep him from dozing off. His big brother stayed home with Grana and helped her with her "farm", on the internet. He rode in the wild Mustang last Friday. That is about it from the Gregg place. Most of my time this week has been getting the GMC ready for the trip to Pueblo. It is all shiny now, with new polish, and has been greased and new Mobil 1 put into the oil pan. We tightened a few belts, put in a new battery tray, and installed a new radiator gaurd. Will get the inside all cleaned up and ready next week. I am ready to roll. Been stuck around here in the heat for most of the summer. The only thing that makes it worth the heat is sitting in that car seat. We enjoy our grandchildren. I try to get one or two every Thursday night. We usually visit the nursing home and grab a cone at the local drug store. This week I became a dinosaur for one so he could ride and spank on me. Hope everyone is doing alright. Come see us. Our 6 year old grandson, Colsyn, spent the night with us last night. We had a date with Mr. Vernon's mare, Lady. We rode the horse for a couple of hours. 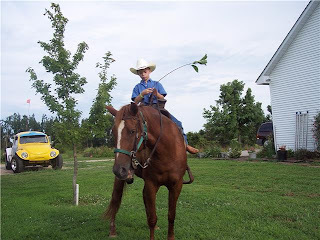 We did not get any shots of him trotting the horse but he is a pretty good cowboy. After an hour or so he was really riding Lady like a pro. The little switch really convinced Lady to get up and go for him. We had a great time out there. 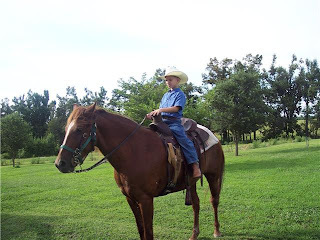 Colsyn hopes to have his very own horse one of these days. I hope that happens. 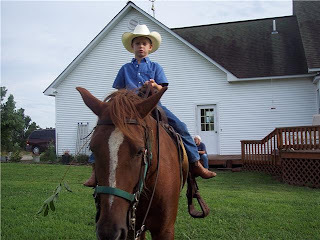 We always had horses when I was a kid and we really enjoyed them. This morning we took a 40 mile ride in a real man's horse. When I shifted into 2nd and slammed Colsyn back in his seat, he took notice. His eyes nearly popped out of his head. Won't be long til he can drive this ole pony himself. Yesterday was Colsyn's day to inherit one of grandpa's pocket knives. He is wearing a bandaid this morning, just like grana said would happen. Now we can't get my bayonette or any of the guns out. Oh well. Yesterday we also hit the local drug store soda fountain. We both had a cone with chocolate ice cream piled on top. After that we took off to the "resting home" to visit older folks. I think it is good for the kids to visit folks in nursing homes. Both seem to really enjoy it. Well, as you can see, we really enjoy the grandkids spending the night. I think it may be time for Colsyn to learn a little bit about changing oil in a vehicle. The mustang should be cool enough now to open the drain. Teri and I are planning our trip to Pueblo, Co. Won't be long now so keep checking on us. Hope everyone has a great weekend. I will try to stay out of the working people's way. Teri and I are in Alabama this weekend. Brought the camera but did not take pictures. My 3rd cousin and his wife, Bud and Alice Gregg, celebrated their 60th anniversary. I had to come. Was here for their 50th. We are staying with my cousin. Her husband is a minister with a local church of Christ here. Heard 2 great sermons today. We visit them as often as we can. Will leave out in the morning heading back to Missouri. 275 miles, all 4 lane highway. Will head north at Tupelo on 45. Run up through Selmer, Henderson, and cross the river @ Dyersburg. It is a beautiful and enjoyable drive. Roads are so much improved over the last 15 years. I suspect when my dad's family moved from here, 1936, it was a one lane dirt road. They had to ride a ferry across the Mississippi. Wow, things have really changed. Wish I could have my grandfather take a trip with me today up the road he moved his family on. That would be neat. Follow along with us if you have time Monday. I have the car assigned as WD0AFQ-1. Ketch you back on the west side of the mighty muddy. Will be getting the motorhome ready for our trip to Colorado when we get home. Teri and I were sitting here, minding our own buisness, Tuesday evening. I looked out the window and told her I thought it might rain. Welcomed it as it has been hot this week in Mo. About an hour later, it did rain. With the rain came winds. I noticed the winds were coming from the east, unusual. Then came the lightning. At 10 pm I flipped the tv over to local news channel. 5 minutes later the lightning and wind got worse, along with the rain. Boom! Big bolt of lightning with thunder immediately following. Then, darkness. Yep, the lightning was so close that the thunder was right with it. I stepped out on the porch and our side of the street had no lights. Went to the rear of the house and no lights on the back side of the block. Lightning had hit a tree and it went down on the wires, or, it hit the transformer. I did not go see. So, we sat here for 30 minutes just talking. I took the wireless router and put it in the GMC so we had our internet back. Oh, I have a small Kipor generator. I grabbed it and we had lights and tv back. We watched tv until 1 am and then went to bed. The electricity did not come back on until 630 am. Another reason to have a small protable generator. Never know when one might need it. We still had gasoline in it from Quartzsite last January. It needed to be burned. Makes me think, maybe I should keep fresh gasoline available. Never know when one might be out of electricity for a few days. The big Onan in the GMC will keep the large appliances running and I try to keep that tank full. Teri was not feeling well or we would have slept in the motorhome, after the storm passed. Would have een cooler. Hope everyone is well. Teri is having trouble with an alergic reaction to something. Has been to the doctor twice and goes back Monday. I am hoping she gets over it by then. It has been with her for over a week now. Often I get questions from folks but can not answer them personally because I have no email address. I enjoy getting questions, especially about our travels and our GMC motorhome. I have never claimed to be a mechanic but I do a lot of things, most, myself. Today I am installing another "shut off" on my battery system. I had it there previously but when I burned up the starter, in Alabama, I melted the cable insulation. I have that fixed now and realize that I do need to be able to cut the voltage to the engine with a turn of a knob. Most maintenance can be done to a GMC by non mechanics. Anyone that can read can take care of a GMC motorhome and also know when it is time to pay for certain things to be done. When it comes to our cars we usually dirve new enough ones that we don't worry much about jumping in them and taking a 2,000 mile plus trip. When it comes to a 12,000 pound GMC, we need to do more than a quick glance at the engine and check the oil. These rigs are all 31- 36 years old. Most motorhomes built during the 70's have long since died. I am very appreciative to the previous owners, of our machine, for taking very good care of it while it was under their watch. It has served, and I hope will continue to serve, us well. I do my best to take care of little things before they become big things. So far, we have not needed a "hook". Preventive maintenance goes a long ways. When I was a kid on the farm, our tractors rarely broke down. That was because when it rained we pulled the equipment into the shed and did preventative maintenance. I never understood why my dad would not let me go to town when it rained. Now I do. So, I try to keep this in mind when it comes to our GMC. We depend on it to get us to where we are going. It sits for a month or two sometimes. I need to keep it happy and check everything I know to check. I take it to professionals when I feel the job is beyond me. I have no tools for big jobs. My driveway serves as my working area. I grease it and keep things tight. Teri is my carpenter. I put her in charge of making changes to the interior. I keep the batteries in shape, watch the tires, and stuff like that. Anyone can do that. We just replaced 4 tires because they were 6 years old. I let them go 1 year longer than I wanted but we were in Az. and I wanted to buy them here. I keep an eye on the brakes. I pay for that job. I keep an eye on my axle boots. I also pay for that to be done. Have done it myself and can never get the boots sealed so they don't leak. I just want folks to know that owning a GMC coach is a lot of fun if you keep it up. We can not let these things sit all winter then jump in and head out on a 1,000 mile ride without doing preventative maintenance. They will break. My GMC talks to me and lets me know ahead of time when we have a problem. I like that. So, if you have questions for me, send me an email. I will get right back to you. OLD SHOE, send me a note....gregg_dan at hotmail.com There are several good buys on GMC coaches right now. Hope everyone has a great week. I was glad to hear from my good friend and brother Russ. He and his lovely wife, Glynna, are up in the cold country of Canada doing SOJOURN work @ a small congregation of the Lord's Church. Thanks for checking on us. We are heading to St. Louis early in the am to be with a friend while his wife undergoes knee replacement surgery. Say a prayer for our safe travels.